I spend nearly all weekend flat on the sofa because I hurt my back. Good news is, I had lots of time for Facebook and browsing the internet. I managed to tangle quite a few tiles too. This spare time resulted in me preparing a new blog post. I stumbled across another easy pattern this week. Willow Bree kindly allowed me to share my interpretation of the pattern with you. I can just see myself writing words with this bubble writing style pattern! It’s a great pattern to divide string lines, too. After my friend Alice posted some artwork featuring the pattern Tweety by mollossus (Sandra Strait), I had to look it up. Sandra came up with this pattern in 2010 already. Check out her blog http://lifeimitatesdoodles.blogspot.com/2010/12/my-tangle-pattern-tweety.html. She has designed many beautiful patterns in her Flickr Album . I am a big fan! While redrawing the steps in Ina style, I came up with a nice tangleation. You will definitely be seeing this pattern pop up on a regular basis in my artwork! Thank you Sandra, for the inspiration and allowing me to share your pattern in our Tangle It! Pattern Club. 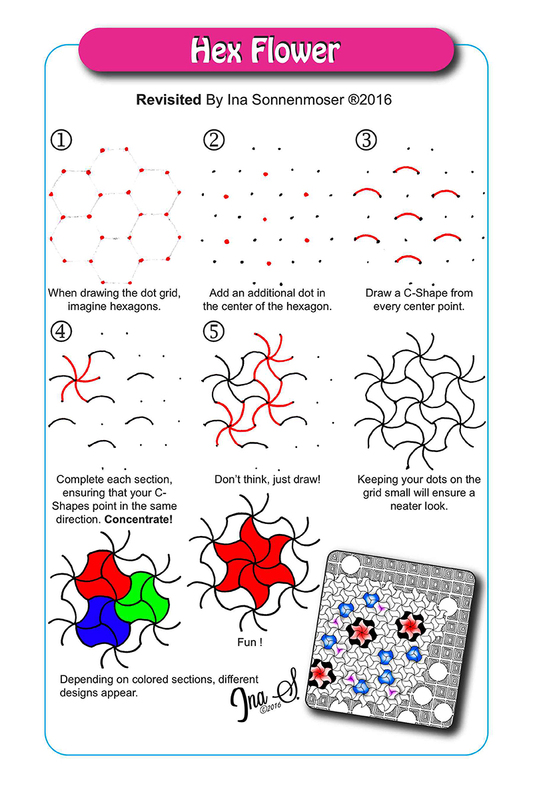 Seems like my brain was a step ahead with the step by step instructions for Hex Flower. I have now included more detailed instructions on the initial step – the hex dot grid. I am totally addicted to this pattern. When I start, I can’t stop. It just grows and grows and grows. Visiting my favorite art supply store, I discovered a new brand of pens I haven’t tried. They are Derwent Graphik Line Maker. Normally I hate 0.05 pens. Within 5 seconds the nib disappears because I tend to push down too hard. These pens have survived the first drawing session and the ink just flows so very smoothly. They glide over the paper so smoothly. It’s a pleasure to work with those pens. As you can see from the above picture, I am very busy filling my Tangle It! Practice Book. 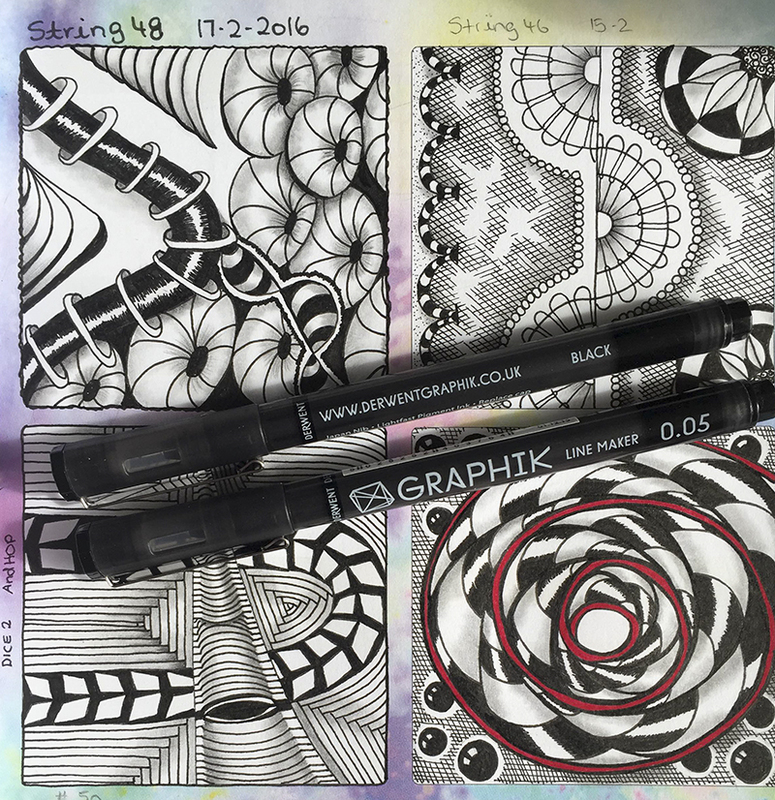 Alice is posting a string a day in her Facebook group Zentangle All Around. With the additional pre-strung tiles in the practice book, I am getting enough zen before bedtime. Wishing you a zenful day! I have to share this fun pattern with you. I was playing with it the other day and thought it a shame to hide it only in the book. Originally we had planned to include 52 new patterns. We had so many pretty patterns stepped out, that it was impossible to select only 52. We ended up including 101 pretty patterns. I am using my Planner all the time – however, I decided to tangle different strings on the weekly pages. So, just before bedtime I grab my planner and tangle away. The only problem I have is, that I cannot stop at just one square per day. So I will finish my Planner in 6 months instead of 12 ..haha.. While defining what kind of grids I will use in my book, I got completely hooked on the hex grid. In this blog I will show you how I draw my hex grid and then expand this post to introduce a new pattern and the ‘extreme’ tangleation. The hex dot grid will be used extensively in future patterns that are going to be released by me. I call this Hex Flower – it makes sense to me to refer to the grid that I used, to identify the pattern. I do recommend that you draw each swirl individually. Otherwise you get confused after the 4th arm. And here we have the extreme version! It looks even better on a warped grid! 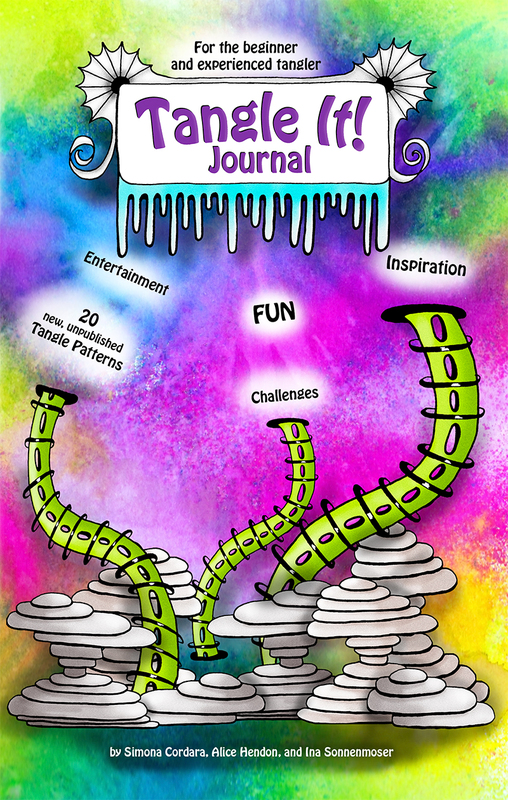 If you are one of the lucky people that own the book Tangle It! Practice Book, then you know all about pattern morphing. The picture below shows you extreme pattern morphing! I did not shade or color this yet. How many different patterns can you spot?